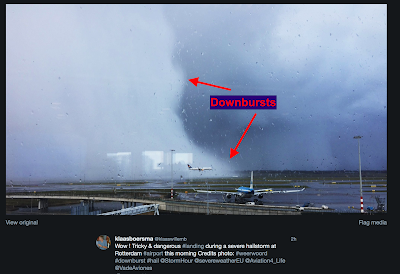 MSE Creative Consulting Blog: Landing Airliner + Downbursts = Danger! Danger! Danger! Landing Airliner + Downbursts = Danger! Danger! Danger! This photo came from Twitter yesterday. It is of an airliner about to land in Rotterdam. Even a quick glance reveals there are two downbursts in the hailshaft. The first has hit the ground and is spreading out (evidenced by the "toe", arrow). The second is revealed by the curl on the edge of the hail. Both of these represent mortal danger to a landing aircraft. In my opinion, the Captain and First Officer should be immediately required to be retrained on convective (thunderstorm-related) weather and downburst avoidance.